I'm having so much fun planning the picnic for Craniofacial Acceptance Month in the Austin area. Our local grocery store, HEB, sounds very interested in sponsoring by providing drinks for the event and my boys' school, right here in our neighborhood, has offered to step in and be a part of it as well. How are you raising awareness this September (or, year round)? In less than two weeks, our days will be busy with school, work, practices, meetings, and homework. I can never seem to figure out why summer goes by so quickly and how my boys have grown so much in just a few months. Pants that fit in May are now too short, and somehow their feet grew several inches too! Sunshine and warmer weather, it seems, make children grow faster. For me, the anticipation of a new school year brings several emotions. There is the excitement of starting fresh again mixed with the sadness of replacing pool towels on our laundry room hooks with backpacks and lunch boxes. There is the dread of cleaning out closets and drawers mixed with the wonderful feeling of being organized. End of summer for us also includes the relief of getting through several clinic appointments, radiology tests, and sometimes (but thankfully not this summer) surgeries. Medically speaking for Peter, this was a very good summer. With the calendar quickly filling up, we decided to take one last family vacation before school starts. We are heading "Up North" as we Michiganders like to say. I’m excited to go back to the beautiful woods, lakes, and rivers; to be “unplugged” for at least a few days; and to enjoy and be thankful for my happy and healthy family. We will be staying a few nights at the Inn where Darin and I were married, and I’m really looking forward to sharing the place with our boys. It’s where our family began, and I think it’s the perfect way to enjoy our last few days of summer. 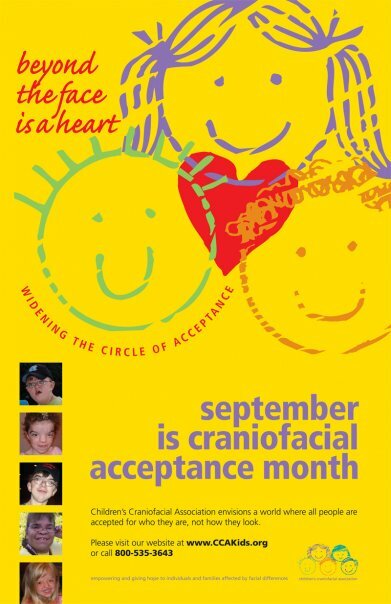 September is quickly approaching and that means it will soon be "Craniofacial Acceptance Month". Even though I do my best to raise awareness about craniofacial conditions year round, having the month of September designated with this special title gives us all an opportunity to make the most of it - especially because it is the time of year that everyone heads back to school. 1. Ask your child's school if you can hang a poster during the month of September to promote Craniofacial Acceptance Month. 2. Offer to talk with your child's class. Discuss your child's condition at an age appropriate level and in a way that your child is comfortable with. Dede has some great ideas in her post from a few days ago. 3. Host a picnic. CCA will send invites to local craniofacial families, making it an opportunity to meet others you may not have met already. I'm also going to hang information about the picnic throughout my neighborhood. I would love for my community to come learn more about these amazing kids, CCA, and how they can foster a supportive environment for kids with facial differences. 4. Submit your story and info about CCA's Craniofacial Acceptance Month to your local newspapers, radio stations and tv stations. The more exposure we get, the more awareness is raised. Let's take advantage of September to help support CCA's vision and to spread the message that "Beyond the Face is a Heart". To get started, email Annie Reeves (anniereeves2@yahoo.com) to receive a Craniofacial Acceptance Month packet including templates, posters and all info you will need to start your very own awareness campaign. Leave a comment and let us know how you plan to spread the word! And be sure to email me at ccakidsblog@gmail.com with photos from your event. We will compile them at the end of the month and feature them right here on the CCAKids Blog! Back-to-school planning continues at our house this week. Yesterday was, gasp, haircuts. Peter HATES getting his haircut. Jacob, however, can’t get in the chair fast enough, anxious to be finished and collect his sucker. I know Peter’s anxiety has to do with his sensory issues, but I still can't grasp just how irritating something as simple as a haircut must be for him. When Peter was a toddler, I sometimes cut his hair while he was asleep-- ditto for trimming finger and toe nails. He did years of sensory therapy from birth to about age four. We played with dry rice, silly putty, shaving cream, and all other variety of gooey/textured things you can possibly imagine (note previous blog about finger painting with pudding). The therapy definitely helped. He is, after all, able to sit in front of a plate of food without turning away and gagging, and he doesn't totally freak out anymore when his hands get sticky. There are definitely lingering issues though. I know he hates to get any food on his face, hence the wet washcloth always next to his plate for meals. Loud noises, like sirens, appear to be actually painful for him. And, like I said, he despises having the hair fall on his face and neck while getting a haircut. He is also deathly afraid of snakes, crabs, geese, and bees. Why, I have no idea because he has never been stung, bitten, or pinched by any of the above. I do recall a goose once hissing at him around the age of 3. But, he's almost eleven now! I admit that I often loose my patience with Peter's strange behaviors. An excursion intended for carefree family fun often becomes a frustrating and disappointing outing. We recently spent a day at the zoo, and I forgot just how much Peter feared geese until we had to walk by a gaggle of them looking for free handouts. I chaperoned a school field trip where he was so afraid of snakes and bees that he refused to go on a nature hike with his class. We've taken boat excursions where Peter went hysterical when they've pulled up crab traps. When snakes are brought into school for "Science Alive", Peter hides under the teacher's desk. He refuses to eat outside on our deck because of a potential bee encounter and on and on it goes. For me the real question is, "Will it ever end?" Peter's fear of needles and what he calls "the white room" (the operating room) are things I can understand. Some of these other problems I only grasp in a very limited way. Things like loud noises and his dislike of haircuts I get a little more than his inability to walk on the beach for fear of a sand crab. The reality, however, is that these issues are frustrating and disappointing. They make me sad. I can't fix things for him, and I see how much fun he misses out on as a result of these phobias. When our other son is afraid of something, we help him work through it rationally. That approach has no affect on Peter as his fears come from somewhere much deeper. Places so deep that only he will ever understand them. As we grow and learn together, I just hope to be a source of comfort and security when he needs it. At our house right now we are busy getting appointments and shopping done in preparation for the start of another school year. Peter also just got braces and new glasses, so I think we are just about ready for the first day. In Michigan that is not until after Labor Day. 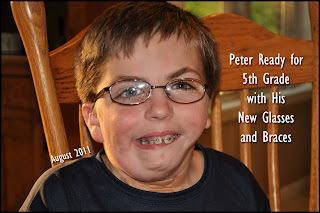 Peter is going into fifth grade this year, so all the kids in his class are familiar and used to his differences. He goes to a private Catholic school that has zero tolerance for any aggressive behavior (teasing or bullying). This gives him a well-protected and very caring environment for learning. Peter will be with these same students through eighth grade, so I’m not nearly as anxious about the approaching middle school years as I would be if he had to change schools. Also, I have really grown to love the kids in his class and how compassionate and protective they all are toward him. I have been invited to speak about Peter’s differences twice since he started at his school in first grade, and each time I have really enjoyed the experience. In fact, I think I got just as much of an education out of it as the kids did. Each time, they delighted me with their care and concern, their interesting questions, and their knowledge. Peter also served as my assistant and loved soaking up all the extra attention. Each time I came to the classrooms, I brought in items they could pass around and hold, including a trach, a feeding tube, and a prosthetic ear. We talked about how each one works and even squirted water through the feeding tube and watched it flow into a bowl. I also brought in photos that showed how Peter’s ear was made and pictures from CCA retreats showing other kids with facial differences. We talked about the unique faces in the photos, how they look different and sometimes get teased, why they have a lot of surgeries, and how they enjoy and want to do the same things as any other kid their age. In first grade, I read the book “It’s OK to be Different” by Todd Parr and also sent home an information packet. Included in the packet was a letter from Peter to his classmates written in language that a 6-8 year old could understand, a more detailed letter to parents explaining Peter’s differences, and some of CCA’s educational materials about craniofacial issues and Goldenhar Syndrome. As September is craniofacial awareness month and the beginning of a new school year, I think it is an excellent opportunity to talk to students and spread awareness and education about facial differences. In speaking to Peter’s class in first grade and again in third grade, I was intrigued by how the kids had matured, asked very different questions, and expressed different concerns. Now that he is going into fifth grade, I can only imagine what they might come up with! At this age, 10-12, I think a more formal presentation with photos and text promoting a healthy conversation on social and medical issues will be age appropriate. I’m also thinking that, as Jacob enters first grade this year, it might be a good opportunity to start educating his classmates too. CCA is developing an education program aimed at helping parents speak to classrooms about craniofacial differences. If you have anything you are willing to share, I am sure the staff would love to hear from you. Let’s get a conversation going… Have you ever formally talked to other kids about your child’s differences? How did it go? Do you have any advice for other parents? What about siblings? Have you talked to their class too? Head on over to the CCAKidsBlog Facebook page to see who won the Tsukishoshi shoes giveaway! This week marks the one year anniversary of my 40th birthday (wink, wink). I feel GREAT, more like my old self and less like the stranger that possessed my body and mind for the last decade. What happened you ask? It’s a long story, but I’ll try to give you the brief version starting with my 30th birthday. That was the day I had an amniocentesis done after just finding out that “there is something wrong with the baby.” Then there was Peter’s complicated, traumatic, and two-month early birth that had me scared out of my wits. That was followed by his over three-month stay in NICU, which really was a cake walk compared to taking care of him at home his first year. There was also the constant fight with our state Medicaid as well as the management of Peter’s numerous clinic appointments and piles of paperwork. It was a very lonely time for me even though we had a constant stream of strangers (therapists, nurses, and social workers) in and out of our house. In the midst of surviving Peter’s first year, I was dealt another blow by the sudden and tragic death of my brother. I also had two very early miscarriages during that time—one at his funeral. How can all this be happening to me I thought? How much can a person take? What ensued was a very long bout of guilt, grief, and depression. I rarely left the house, was in a constant state of fear with the responsibility of Peter’s care, and sometimes never even showered or dressed for the day. It’s really something that I can’t even describe. I did gradually claw out of the darkness. I had to for Peter’s sake. We had big decisions to make about surgeries and specialists. Those 2-3 years flew by in a blur of accomplishing what had to be done for Peter. Then, just as I was thinking life was calming down a little, SURPRISE again! I was pregnant. At the earliest opportunity, I had a high-level ultrasound. Once that came back normal, I did get excited about welcoming another baby. Also, Peter had his trach removed about a week before Jacob was born. We had a MAJOR celebration over that milestone!!! Things were definitely looking up. Jacob’s birth, when I was 34, was a great joy. For me, it was very healing compared to the trauma of Peter’s arrival. I (stupidly) thought taking care of this baby would be easy compared to what we went through with Peter. Boy was I wrong! It turns out that all babies are exhausting—even the so called “normal” ones. Who knew?! Jacob never slept more than a few hours at a time and was very colicky. Poor Peter endured countless hours of hearing his new brother scream his head off and take all the attention away from him. I do recall good times and laughs during all those years, but they were definitely overshadowed with a lot of responsibility. I still remember the words of the geneticist who diagnosed Peter. He said, “This is not doom and gloom. But, this is a very rough road.” Life is challenging and messy. We aren’t given the luxury to choose our trials, but we do have the choice to grow and learn from those events. I’ve never shared my full story, but I’m hoping that it gives support to other Mom’s like me. Nobody would ever choose to have their child go through as much pain as ours do. It is not your fault. Let me repeat that again, IT IS NOT YOUR FAULT that this happened. You will survive the many challenges of motherhood, and, eventually, you will emerge a wiser and more compassionate person. I hate to tempt fate too much, but I say bring it on world! I think us “special” Moms can handle just about anything—wrinkles and all. As I mentioned in a previous post, both See Kai Run and Tsukihoshi have provided the opportunity for one lucky CCA Kids Blog reader to take home a pair of their awesome shoes. The See Kai Run winner was: Tammy Wilson. And now it could be YOUR turn to win, courtesy of Tsukihoshi. This line of tennis shoes is the cream of the crop. They come from a company who has really put a lot of thought into what our kids wear on their feet. They have an entire page on their website describing their shoes "Special Multi Functions". You really need to check it out! Not to mention that I found it nearly impossible to find a solid pair of tennis shoes for Aiden. That is, until I found these! Trust me, even if you don't have a child with Apert Syndrome, you will love these shoes. And so will your kiddo! 1. If you haven't already, head over to Facebook and "Like" the CCA Kids Blog page. The winner will be announced there so you don't want to miss out! 2. Also "Like" the Tsukihoshi Facebook page. ** The giveaway will be open until Friday, August 5 at 11:59pm EST. A random winner will be chosen based on the number of comments received. The winner will be announced Saturday, August 6th on the CCA Kids Blog Facebook page. I will ask for your contact information at that time so that I may send instructions for placing your order.